Other Products by Giant Sports. Search other Beef Protein products. 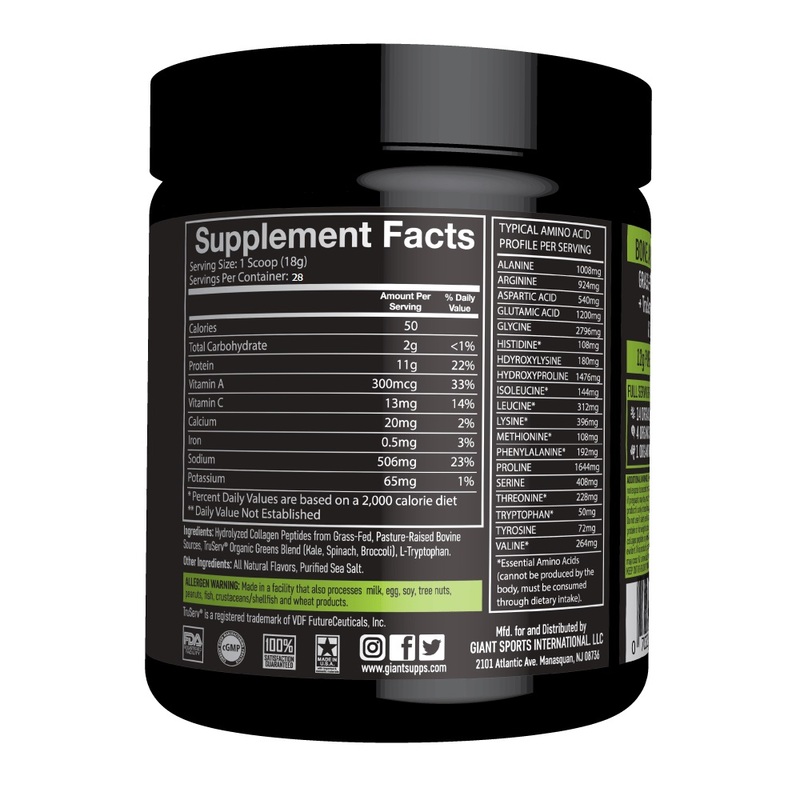 Bone Broth plus Greens is a delicious chicken soup containing nutrition to support many areas of the body: joints, skin, hair, nails, cartilage, bone and collagen. Each bowl of soup has also been topped up with tryptophan. This is the only essential amino acid not found in collagen. This makes it a more complete and health-promoting collagen product. 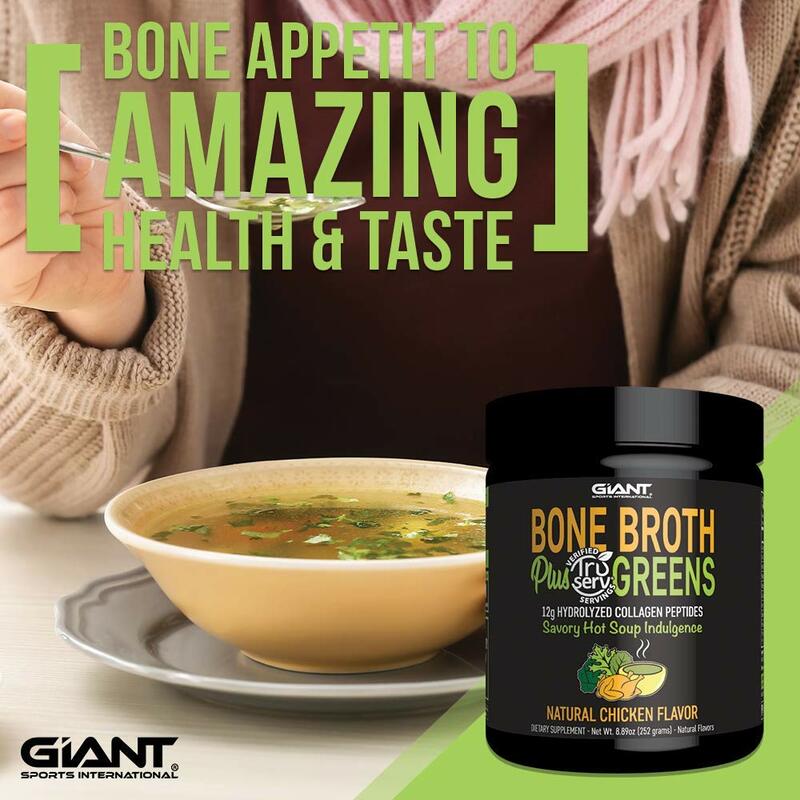 Bone Broth plus Greens is the perfect winter warmer or year-round nutrition booster. Giant Sports have used all natural flavours and sea salt as a natural flavour enhancer. There is simply nothing artificial or chemical found in this product. Each bowl of soup is pure chicken-flavoured heart-warming goodness. Collagen peptides are gaining more and more popularity as people are looking for nutritional support for joints, skin and bone. 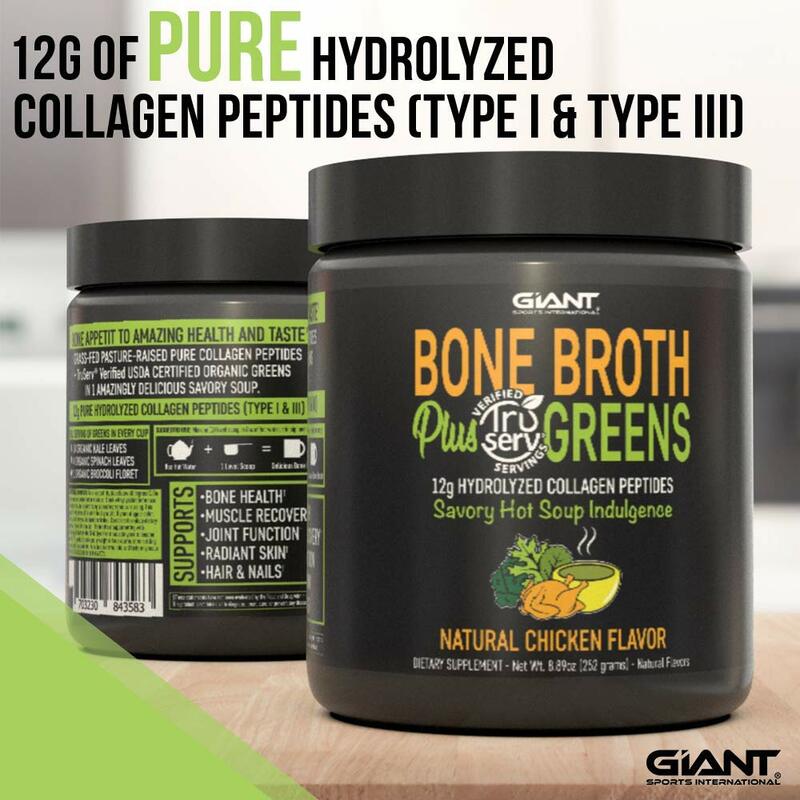 Collagen, due to its content of hydroxyproline, hydroxylysine and glycine, contains foundational nutrients to support the health and integrity of these tissues. Collagen-based products are often used by strength trainers, or for anyone involved in heavy lifting. This is due to the stress that these types of activities place on articular cartilage, tendons and ligaments. Giant Sports have done a fantastic job on creating a product that offers superior nutritional support to most collagen products, with a flavour worthy of a Michelin star. Mix 1 Scoop into 250ml hot water, stir and enjoy! 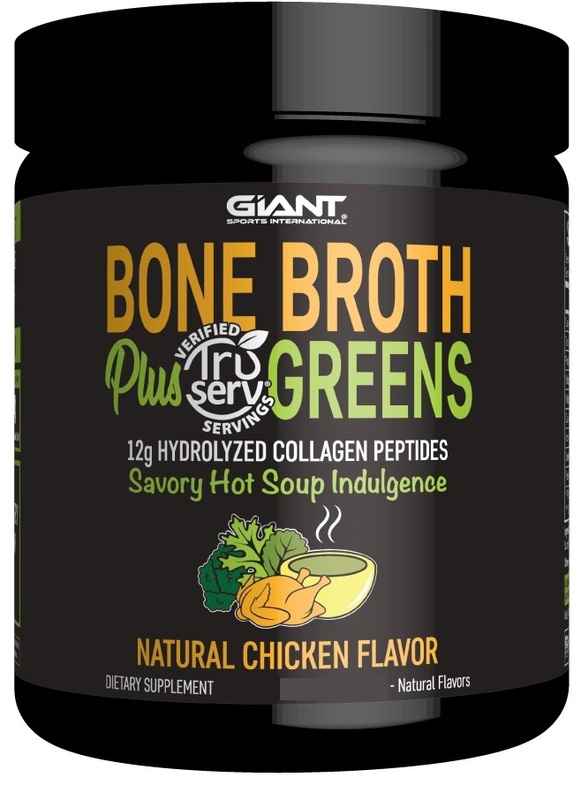 Giant Sports Bone Broth plus Greens Chicken Flavour INGREDIENTS: Hydrolyzed Collagen Peptides from Grass-Fed, Pasture-Raised Bovine Sources, TruServ Organic Greens Blend (Kale, Spinach, Broccoli), L-Tryptophan. OTHER INGREDIENTS: All Natural Flavours, Purified Sea Salt. ALLERGEN DECLARATION: Made in a facility that also processes Milk, Egg, Soy, Tree Nuts, Peanuts, Fish, Crustaceans/Shellfish and Wheat Products. Not Getting Results From Your Creatine? Then Your Not Using It Properly.